"This is a great Mexican dish for our bigger family. Could be made ahead for potlucks too! This recipe I threw together with what I had on had one night that sounded good together! Could be done with chicken as alternative too. I served this with cooked spinach and put my portion of casserole over the spinach." Heat a large skillet over medium-high heat. Cook and stir beef in the hot skillet until almost browned and crumbly, about 5 minutes. Add onion; cook and stir until beef is browned and onion is softened, about 5 minutes more. Mix water and taco seasoning into beef mixture; simmer until water evaporates, about 5 minutes. Line the prepared baking dish with tortillas and top with 1/2 of the ground beef mixture. Spoon 1/2 of the corn over the beef layer and top with 1/3 of the Cheddar cheese. Crush tortilla chips over cheese layer. Repeat layers with remaining ingredients, ending with Cheddar cheese, tomatoes, and olives. Bake in the preheated oven until heated through and cheese is melted, 15 to 20 minutes. 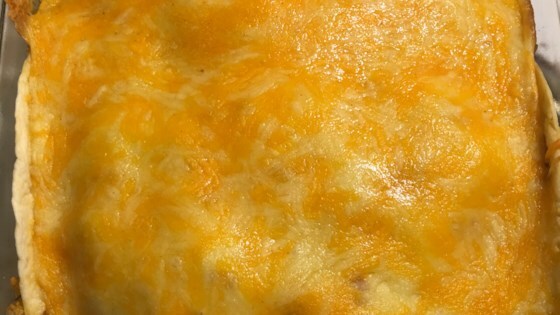 This cheesy, family favorite is the perfect weeknight casserole. Good, quick and easy: the trifecta! I changed it up a bit. Substituting macaroni for rice, adding black beans and putting chips on the side as a scoop. It came out really good though! I made it and we really liked it. Even my picky eaters loved it. I made some white Mexican cheese dip and added a drizzle over the ground beef layer. used soft flour tortillas, added a layer of rice, and served with a side of guacamole and chips. yum!! I judge most of my recipes by my 16 year old grandson who is built like a linebacker p. He loved it! This was very good. Family enjoyed it. Made a Mango-pineapple salsa to go with it. Leftovers were even better the next day. Made this one taco Tuesday to switch it up. Really good. will be making it again.